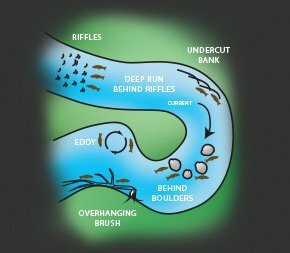 tips & tricks for Fly fishing. In streams, fish above and below riffles, cut banks, and the slack water area behind submerged rocks and cover. Trout prefer to lie in current breaks and obstructions very close to faster moving water. Ideal times of year vary by species, but the best results are usually found in lower light conditions, including overcast days, early mornings, and evenings. 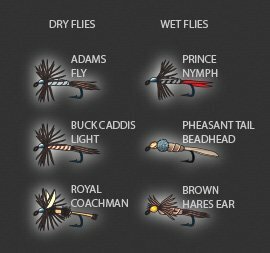 Choose flies in size and coloration that resemble the insects, larvae, and small aquatic prey found in your fishing area. The goal is to imitate the natural forage of the fish you are trying to catch. When fishing a river or stream, cast across the current, upstream from your intended target. Allow the current to drift your fly through the fish holding zone. Complete the drift before the line begins to bow downstream. Keep movement, noise and vibration to a minimum. When wading, avoid casting shadows, making splashes, and dragging your feet. Here are some popular approaches to Fly fishing. This is for general use in rivers, streams and lakes. Insert no-knot eyelet into end of floating fly line (included in kit). Tie thicker end of tapered leader on to eyelet. Insert no-knot eyelet into end of sinking fly line. Tie thicker end of tapered leader onto eyelet. Tie strike indicator 3' – 7' from fly. To keep the indicator buoyant, treat it with dry fly spray or oil. Pass the loop through the ring on the strike indicator. Pass the loop over the top of the strike indicator and pull snugly. Vary the position according to the water depth, moving it further from the fly in faster currents.